Anne S • This entry was posted in Charity Stitching, Finishes. Bookmark the permalink. Oh Anne, he is adorable!!! And your day sounds perfect–pjs, stitching and NO house chores!!! BTW, was looking through the latest “Gift of Stitching” mag and there you were! 🙂 The pic of your basket of smalls was great! Talk to you more in email! He’s so cute! I’ve never seen this chart before. Congrats ! Hes lovely Anne. Glad you liked my spiel on pukekos. My rotation is going well…but I have just found a must do, that I must do now….arrghhhhhh!!!! You know how it is! That is the sweetest little guy – congratulations! You sure whipped him right up! very cute…lots of colour changes! I love having pyjama days! He is adorable! Congrats on the finish. 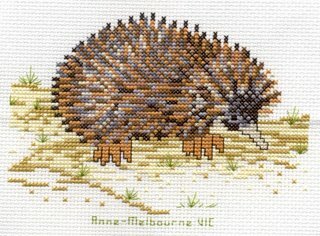 What a neat job you made of the Echidna, Anne – you should apply for a job as model stitcher! Are you tempted to do any more of those Aussie animals? I love Viv Garforth’s designs, they are so uniquely Australian, and made great gifts to send overseas. good job on the finish!